You`ll never want to stay anywhere else!!! 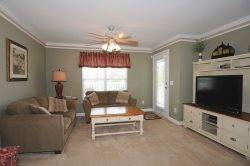 Updated second floor Condo, 3 bedroom, 2 bath. 1 King, 1 Queen. 2 Twin beds. 3 TV's flat screen TVs, tennis courts. Close to Myrtle Beach attractions and Sunset Beach. Elevator. This fantastic condo is located on the Beautiful Crow Creek Course and is in close proximity to the pool. With a wonderful view and flat screen TV's, This condo is perfect for your getaway! . Close to Sunset Beach an Myrtle Beach. Condo also includes Full size washer and dryer. All bedroom and bathroom linens are included and in the condo for you when you arrive. Also the Kitchen is fully stocked with all of the appropriate cooking utensils, dishes and cutlery. Also the Kitchen is fully stocked with all of the appropriate cooking utensils, dishes and cutlery.